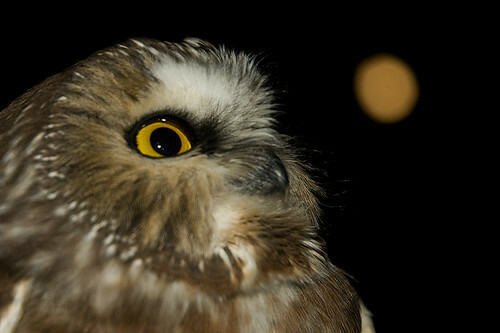 Northern Saw-whet Owl and the moon! I am soo excited; I don’t know where to start. . . . ! Have you ever wondered where the bird you are looking at has been or where they are going? Previously I have discussed some interesting banding recoveries where I recorded two different Black-capped Chickadees who moved 3350 feet from their breeding territory to where they had been wintering (these were my own recaptured birds). I have also discussed on numerous occasions some exciting banding nights where I recaptured some foreign recaptured Northern Saw-whet Owls that had been previously banded by another bander. I am proud to announce that “today” I received a report that another bird bander recaptured one of my Northern Saw-whet Owl last fall (the first time this has ever happened to me, yah!!)!! I first banded this Northern Saw-whet Owl back on October 2006 where I captured 10 newly banded birds and was the perfect fluff ball night! I said in my blog post “Tonight’s weather is almost perfect with very calm winds, clear sky, cold temperature and a waxing crescent moon. I believe that many of these birds were bottled up due to weather and just waiting for a night like tonight.” You can see in the above Nexrad Radar image that many birds were moving that night and I couldn’t have been happier keeping the nets open till 3:30 in the morning. With one of my net checks we had three birds in it and never expected one of these birds being recaptured one year later at the famous Long Point Bird Observatory! Recaptured NSWO map for the Allegany State Park station. The above recapture map shows where my banding station is located (green building) and where the foreign recaptured owls were first banded (blue spots). I still have one owl where I don’t know where it was originally banded (still waiting for that data from the BBL)! The red dot is the location my first recaptured bird was caught last fall at Long Point Bird Observatory (note that I have also captured one of there birds they first banded). I have not talked to the bander at Long Point, so I have little other details to report to you regarding this bird (like exact location, the birds condition, measurements, molt pattern, etc….). I will keep everyone updated if I hear anything else! Yes, it is exciting day when someone reports recapturing one of your birds (and in my case it ending up in another country)! This entry was posted on 18 February 2008 by mon@rch. It was filed under Allegany State Park, Bird Banding, Birds, migration, Nature, Ornithology, Owls, Science and was tagged with Northern Saw-whet Owl. Very interesting and exciting. The “foreign” 🙂 owls don’t know about that Canada US border, and their biggest challenge must be going across Lake Erie and Lake Ontario. Do they go into Northern Ontario to nest in the summer? That’s an amazing photo of the owl and the moon. Very exciting about the recapture, too. I can hear your excitment! How very fun for you. Thank you for showing the map. Wouldn’t it be fun to have a crittercam on a bird? Of course getting the camera back could be a problem. I have thought Mockingbird could wear a crittercam. He would come back for raisins! May more of your banded birds be found and may you have lots of feedback. Knowing how the birds are doing is nice. Tom, excellent report. I guess that really makes banding worth the effort- when great scientific data can be gleaned from your work! Good to see that some other people are catching your birds! Great picture of the Owl and the Moon! Nice! I love recapture data. Are the birds actually crossing the Great Lakes or are they funneling around? Very cool. Your map is awesome! Makes me wonder what the owl must be thinking. Aw, man…a net? Again?? Sheesh! @ Ruth – thanks and “foreign” means it isn’t one of my bands! Not exactly sure but I do know some nest in this area! @ Rondi – thanks and was very happy about the recapture! @ Marg – thanks and thanks for listening to all my babbling! @ Sherry – You have no idea how excited I was this morning! They do have some critter cams for birds and have you see the one with the crow? It rocks! @ Tom – thanks and sometimes you wonder but over time things really start to make sense! @ YN-J – thanks and that was a fun photo to take! 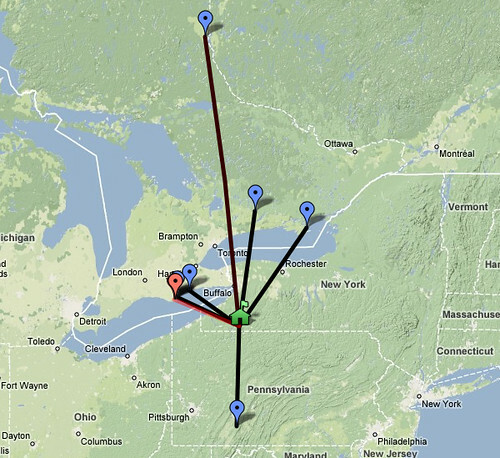 @ Nick – not sure if I could answer that with evidence but my suspicion is that yes they are crossing the lake! Not that others depending on the weather are not going around . . . just depends on situation! @ Mary – thanks and I thought everyone would want to see where these guys are being found! @ Nina – Thanks and that has crossed my mind a few times also! You wonder about the owl that came from so far up north. Was it hanging around during its first winter there when it said “heck no!” and headed south to where it’s not so ridiculously cold! It is good to know that some of the owls go on their merry way through life after being captured and banded. I always like to see where banded birds come from. I can only imagine how exciting it would be to have your own bird show up someplace. Thanks for sharing your excitement with us. This is sooo exciting Tom!! I can’t wait to hear how the birdies are doing!! Awesome Tom! I do find it amazing every time a bird is re-captured again and again. This is very exciting. Those cute little owls fly all the way across Lake Erie. It will be interesting to get your data back and get the details. Tom, that’s really amazing! How exciting to hear where your owl has been. Your hard work is paying off! That’s exciting news. I’m happy you got a band return. That is great that you got a bird return in your banding. It is so exciting to trace the movement of birds and banding is one of the exacting ways. When I see an eagle with a band I get so excited. The picture of the owl and the moon was also exciting!!! I hope you get many more reports of your banded birds and hope that they are all doing well. Amazing photo, Tom. Your excitement is captivating (pun intended!). Seriously, what a thrill. Very, very cool. That is great, simply great! Congrats! @ Joe – they breed up around the tundra and where most of these guys are coming from! They just funnel through certain spots like Long Point. LOL regarding the border! @ Lisa – they sure do and it was great for sure! First time for me! @ Pam – thanks and just maybe more might show up! @ Linda – thanks and they do except those going across lake Ontario! I can’t wait to write this guy! @ Chicago – thanks and it is wonderful learning where they are going! @ Grace – thanks and its about time! @ Islandrambles – thanks and many of the eagles are color banded which allows to know at least what state they are from! Oh well, if they are heading back north, I guess my chance to see them here in NJ is nearly over. Oh well – there’s always next year. Good luck finding some on their way back north! Wow, cool – really gives you a sense of them as individuals, doesn’t it! Great post. I spent much of my Saturday searching for Saw whet without my luck. I did manage to see and photograph some LEO’s was was definitely worth the effort. I’m going to look around here and see if I can hook up with some bird banders. I helped out a couple of times when I was younger in South Africa and it was amazingly rewarding to see the birds close up. Keep up the great work and I look forward to reading more about your adventures. @ Marty – Our peak movement time is Mid March for them moving through in the spring! This bird was caught in the fall and just reported! @ Adam – thanks and it sure does! @ Owlman – thanks and would have loved to get pictures of Long-eared Owls! Keep us updated and great connecting! @ Lisa – thanks and sure does, and Fun! Did your foreign recaptured owl have a cool accent? Neat story Tom. Boy, those little owls sure put on a lot of miles, don’t they? Had to check back. Lunar eclipse tonight. I was thinking about your owl moon photo. I’m still stunned that you live where you live, do what you do and you get paid too? How cool is that?!! btw; Really love the detailed explanation and the owl shot – beyond fascinating. @ Ruthie – thanks and they sure can! @ Grace – wasn’t that nice! I should have taken a few photos . . . but took pictures of something else instead! Will see tonights post! I can imagine how exciting that must be. It must be discouraging after a while not to have any of your banded birds relocated.-I saw a gull that was tagged the other day and tried to get the numbers on its wings-(red dots) but I was riding with someone and they had to go. 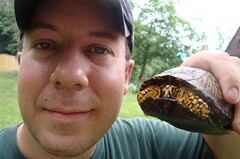 I thought I commented on this already-it’s great when you find out about recaptures-congrats Tom! Thanks for your response. I shall try and find the crow, critter cam, video. I bet it is amazing!